The current design for the European Helium Cooled Pebble Bed (HCPB) ITER Test Blanket Module (TBM) includes basically six subcomponents which have to be fabricated and assembled: first wall, caps, stiffening grid, breeding units, back plates/manifolds, and attachment system. One of the main technologies needed for blanket fabrication is joining of parts, particularly for the production of plates with internal cooling channels and for welding at inaccessible component areas. A further question is the application of suitable post weld heat treatments. Both steps together determine the mechanical strength of the blanket, the ductile-to-brittle transition temperature (DBTT) which is important under neutron irradiation, and the potential for a compact design. The candidate structural material will be EUROFER or some similar reduced activation ferritic-martensitic steel. Joining technologies and/or procedures have still to be developed, adapted, or qualified, although substantial advancements have been already reported. The necessary welding techniques may be divided into two groups: diffusion or solid phase welding, and fusion welding (electron beam, laser beam, hybrid MIG/laser), whereas the first is either performed in a hot isostatic press (HIP) or in a uniaxial hydraulic press, both after different specific preparations. This paper presents a fabrication alternative for the TBM first wall which is based on HIP diffusion bonding of a series of pipes into two half-shells. 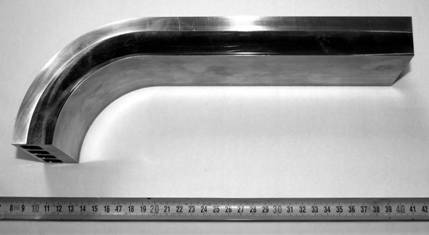 Its main advantages over the existing procedures are (1) the inherent fail-safe design due to the application of the double containment principle, (2) the applicability of cost effective standard fabrication processes, and (3) the dimensional stability of the whole component even after maximum pressure and high temperature HIP cycles without pressure plates and encapsulation. All fabrication steps were tested, evaluated, and optimised as far as possible by specific investigations on weld samples and mock-ups. The results are presented in detail and the according conclusions are drawn with respect to the fabrication process parameters. The final test of the recommended first wall fabrication was performed on a mock-up with 4 cooling channels including the rounded corner of a TBM (see Fig. 1). Fig. 1: Mock-up with four internal cooling channels of the relevant part of a TBM (the rule is in centimetres).